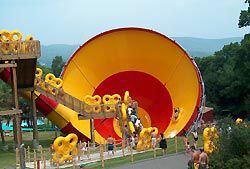 The visually striking water park ride, High Anxiety at New Jersey's Action Park, sends passengers in four-person cloverleaf tubes down a steep slide and into an enormous funnel. The tubes climb back and forth along the walls and produce some exhilarating free-floating sensations before water jets shoot them out the narrow end of the funnel. One of only three rides of its kind when it debuted in 2003 (the other ones were at Holiday World's Splashin' Safari, IN and Six Flags New England's Hurricane Harbor, MA), High Anxiety is an unusual looking, fun attraction. As much of a hoot to watch as it is to ride, the bright red and yellow funnel structure is an imposing sight on the park's mountainside. Situated near Action Park's main gate, it's hard for visitors to tell what's going on when they first approach the backside of High Anxiety. There they see riders fly through a tunnel, get soaked by a curtain of water, and bounce off the walls of a catch basin before they come to a halt. As visitors come around the other side of the ride, the sheer scale of the funnel and the attraction's crazy concept come into full view. Riders climb up a tower (one of the few at Action Park, since most of the rides use the mountain's natural terrain) with the cloverleaf tubes they picked up at the ride's exit. When it is their turn, a ride op pushes them into an enclosed launch tunnel for a 40-foot drop at a steep angle that empties into the funnel. The screams generally start in the tunnel and sound a bit muffled. When the riders soar up one side of the funnel however, the screams really erupt and reverberate throughout the mountainside. The 50-foot long funnel, which is 60 feet in diameter at its opening and tapers down, acts as a huge echo chamber. Depending on the number of riders, their weight, and their distribution, the tubes rise anywhere from 15 to 25 feet along the far side of the funnel before momentarily stopping and sliding back in the other direction. At that moment, riders experience a delirious free-floating feeling. The tubes head up the other wall of the funnel, although not as far as the first time, and deliver a smaller dose of airtime. As the tubes float back up the opposite side and move forward in the funnel, a blast of water shoots them through the narrow end. In a park filled with wedgie-inducing, wild experiences, High Anxiety is one of Action Park's signature attractions.